Myanmar’s military (Tatmadaw) has since been deployed in the Rohingya populated northern part of Arakan (Rakhine) state. And what we are witnessing there is simply shocking. War crimes are perpetrated. Under the pretext of finding the Rohingya perpetrators, the Tatmadaw has been doing what it has always done – using its criminal scorched-earth tactics. As a result, since the Oct. 9 attacks, at least 133 unarmed Rohingyas (mostly children and women) have been killed, or have died in custody. Over a hundred Rohingyas have been detained, several villages and more than a thousand homes and several mosques have been burned by the security forces forcing an internal displacement of at least 15,000 people, who are even denied humanitarian aid. Many of the local elders and Imams have also been killed extra-judicially after they were asked to report the local military camp. Human Rights Watch (HRW) warned in a statement Friday that as troops poured into the region and authorities blocked off the delivery of humanitarian aid to Maungdaw, aid agencies have not been able to conduct a needs assessment. The statement quoted a World Food Program (WFP) partnerships officer as saying they had requested access “from township level to Union level”. 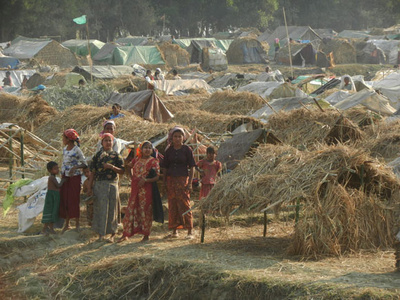 WFP told HRW that 50,000 people remain without food aid in Maungdaw. This latest ethnic cleansing drives against the Rohingya are simply sickening in a country that is led by someone like Suu Kyi who was honored with a Nobel Prize for peace. What a joke this award is becoming! Apparently, she has failed to learn lessons from history, esp. why her wise father Aung San had organized the Panglong Conference in the pre-independence days. Let Suu Kyi do the math and figure out what is better for her fractured and artificial country. The sooner the better!